It’s Denise again! It’s my last day and then Heather’s taking control again! Since we hit a Crappy Doodle theme yesterday, what do you say we keep it going? How about a Crappy Doodles! mug??? The other side, not shown, has the title Twenty-Eight and a Half Wishes. I’ll even throw in some tea bags even though I have coffee in the mug in this picture. And yes, that’s my OWN mug, but I promise to give you your very own unused one. So what’s the question today? It’s no secret that I’m a coffee lover. If you win this mug, will you be most likely to drink coffee or hot tea out of it? Or maybe hot cocoa? You have until Wednesday midnight, CDT, June 20 to leave a comment to enter. Winner will be picked with Random.org. What will you drink from this mug if you win? The winner of our Day Three Giveaway is….Stormy!! 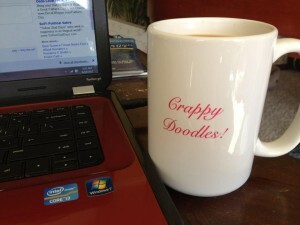 We will be contacting you by email so we can ship your crappy doodles mug. Congratulations! I would drink hot chai tea. I can’t function with out my coffee ! Am I disqualified if I don ‘t drink coffee or tea? I’d use it for hot chocolate ! I would be drinking either hot tea or hot cocoa or just anything. I drink all of the above however my favorite is COFFEE. My kids don’t have tea parties, we have coffee parties! Both! Coffee in the morning and tea in the evening! I would drink mostly coffee but I also drink hot tea … I also make hot tea and then pour it over ice for fresh brewed iced tea … so it would be a multi purpose cup! Funny, today while washing dishes I broke my favorite coffee mug. I’ve had it for years. Needless to say, I’m pretty bummed. Silly, huh? Black Silk Coffee with Chocolate Rasperry Creamer mmmmmmm I want some right now! different stuff, but fave hot drink is hot chocolate with hazelnut! Coffee! Peet’s French Roast to be exact!